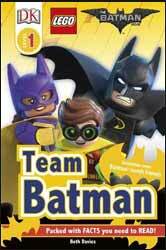 Team Batman is a level 1 book from DK in The LEGO Batman Movie series of learn to read publications. It's an entry level book designed for parents to help their children in the early stages of reading. The pages are bright and colourful, and the text is simple enough, with the bigger words repeated enough that this shouldn't take too long for a young reader to master. The text introduces us to The Batman, Gotham City, Robin and Batgirl, as well as looking at Batman's vehicles and Batman's enemies (or "The Rogues" as they're referred to). There's even a mini quiz at the back to see if the young reader has remembered any facts while reading. Overall this is a great little book that will entice tiny minds to learn to read.